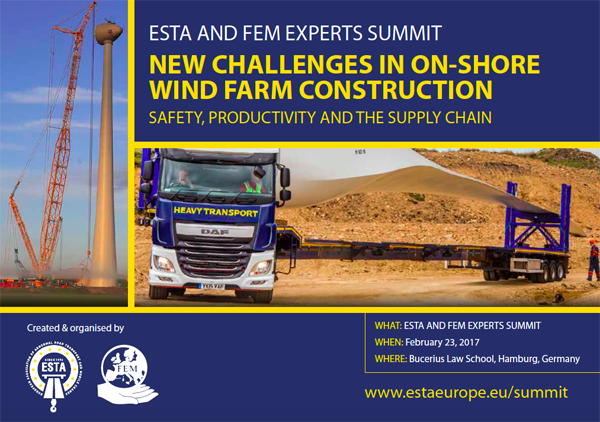 The European Association for Abnormal Road Transport and Mobile Cranes (ESTA) and the European Materials Handling Federation (FEM) have confirmed that a number of turbine manufacturers and wind farm owners will be attending their upcoming summit on safe transport and lifting of wind turbine components. The one-day event will take place at the Bucerius Law School in Hamburg and is a response to the industry’s growing concerns about safety during the erection and transportation of wind turbines. The agenda includes speakers from Vestas, Siemens, Mammoet, Terex, GE Renewable Energy and Liebherr. The Summit has also received strong support VDMA Power Systems in Germany, whose members include many leading developers and turbine manufacturers. At the time of writing, companies attending include: Senvion, Nordex, Vattenfall, Siemens, Vestas, EDF, Acciona, BMS, Mammoet, Tadano Faun, Liebherr, Terex, TII, Nooteboom, CRM, Nuon, Hermes Heavy Lift, Collett Group, Wagenborg, Faymonville, Hovago Cranes, and many others. Søren Jansen, ESTA director, has been warning of problems during the erection and transportation of wind turbines. He said: “This is an issue because in Europe the height of the turbines is increasing and with the cranes we have now, we are using them to their limit. As the tower heights increase further, we will see even bigger cranes having to be used, which will in turn affect the requirements for the hard stands, which will have to withstand higher ground pressures and increase in size.